Queensville Police help with driver whose SUV got stuck in floodwaters in Townsville on Sunday, February 3, 2019. The Australia city was inundated after nearly 40 inches of rain fell in the past seven days. Monsoon rains have dropped nearly 40 inches of rain on Townsville in the past seven days. ] Hundreds of people have already been rescued from their homes. The downpours are expected to continue in Monday. Crocodiles are being spotted in residential areas. danger of being flooded after a week or monsoon rains have dumped nearly 40 inches on parts of Queensland. The coastal city of Townsville has had a year's worth of rain in the past week the Bureau of Meteorology (BOM) said Sunday. The seven-day total to 9 a.m. Sunday (6 pm Saturday EST) was 39.84 inches (1012 mm). Torrential rain is expected to continue over the coming days, adding even more water to rivers that have reached major flood stage. Dean Narramore, a BOM meteorologist, said the monsoon rains are the result of a low pressure trough that has been stationary off the Queensland coast. Several areas of the state have seen up to 3 feet of rain in the past week, as well as much of the rest of Australia continues to suffer heat and drought . 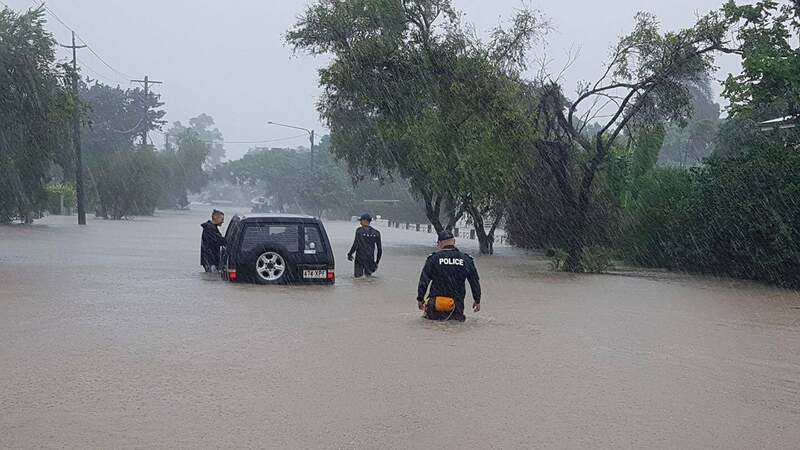 Flooding had directly impacted 300 homes by Saturday afternoon, Townsville Police District acting Chief Superintendent Steve Munro said. He expected number to rise to more than 500 by Sunday morning the Courier Mail reported. The monsoon rains have pushed the Ross River to record levels. In an effort to prevent more widespread flooding downstream, Townsville officials allowed the floodgates of the Ross River Dam, which had reached 250 percent of capacity, to open fully shortly after 8 pm. Sunday (5 a.m. EST), the Guardian reported. Officially allowed the floodgates of the Ross River Dam in Townsville, Queensland, Australia, to completely prevent more widespread flood damage. Residents in 20 suburbs were obliged to prepare for imminent flooding and ordered to evacuate their homes. With the dam gates fully open, "we'll see dangerous and high velocity flows in Ross River, resulting in a risk to life and property," BOM hydrologist Andrew Preece told the Australian Broadcasting Corporation. "We'll see unprecedented areas of flooding in Townsville, a number of access routes cut, over the next 24 hours or so." Schools in the area were closed Friday and will remain closed Monday because of the flooding. All flights into and out of the Townsville airport have been canceled until further notice. At least three crocodiles have been spotted in the floodwaters, the Townsville Bulletin reported. Emergency services officials reported 6-foot croc in the Rosslea suburb Sunday night. Crocodiles were also seen in residential areas in Mundingburra and Annandale. (MORE: safety. More than 17,000 homes had no electricity as or 9:30 p.m. Sunday, the Townsville Bulletin reported. More than 200 people had been helped from their homes by swift water rescue teams, Queensland Fire and Emergency Services (QFES) chief superintendent Lance Duncan said customs ABC. The Townsville Bulletin said there had been unconfirmed reports of people having been rescued from their roofs in the Annandale suburb. There have been reports of injuries. In the Hermit Park neighborhood, Randall Parker used and inflatable mattress to get his family out of their flooded home. "It's just unbelievable, we've never seen anything like it," Parker told the Courier Mail. "It just keeps bucketing down . I just had to get the family out including a newborn baby as quick as possible." It is the great unknown, not knowing what we are going to come home to. "" This rain is just relentless, "Farrell, a warrant officer in the Australian Army, said. "How much more and what is yet to come?"